Exclusive: Are Raw Ratings A Reflection Of WWE Popularity? Against the first week of Monday Night Football, WWE RAW posted a 1.88 rating for the episode that aired Monday. That’s the program’s lowest non-holiday rating since 1996: a time when RAW was opposed head-to-head by WCW Nitro. The 1.88 rating, reported by PWTorch.com, was only slightly higher than the 1.87 RAW posted on the Fourth of the July. It’ll likely be a challenge for RAW to get back over a 2.0 rating for the remainder of the NFL season, which runs through December. WWE’s flagship show will face even stiffer competition in two weeks on September 26 as it goes against a live U.S. presidential debate as well as an NFL game. The outright all-time low rating for RAW was a 1.5, set on December 23, 1996. RAW’s current viewership is nearing ever-closer to the level of TNA’s peak. Breaking through the 1.5 barrier would edge RAW ratings closer to the highest rating ever for TNA Impact, which did a 1.45 for its January 4, 2010 episode. That low mark may not be reached this year, but it’s not out of the realm of possibility for the rating to drop that low sometime during the current term of WWE’s contract with USA Network parent NBCUniversal, which runs until about September 2019 and will likely be renegotiated early in that year. 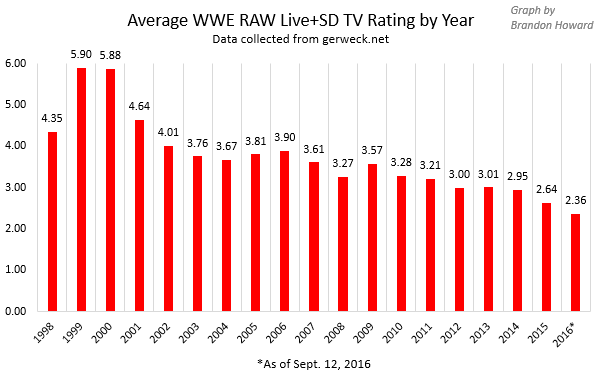 The average rating for RAW has decreased more often than not most years since the show’s peak in 1999 and 2000. The decline has been particularly remarkable in the last two years after the average rating was relatively flat from 2011 to 2013. 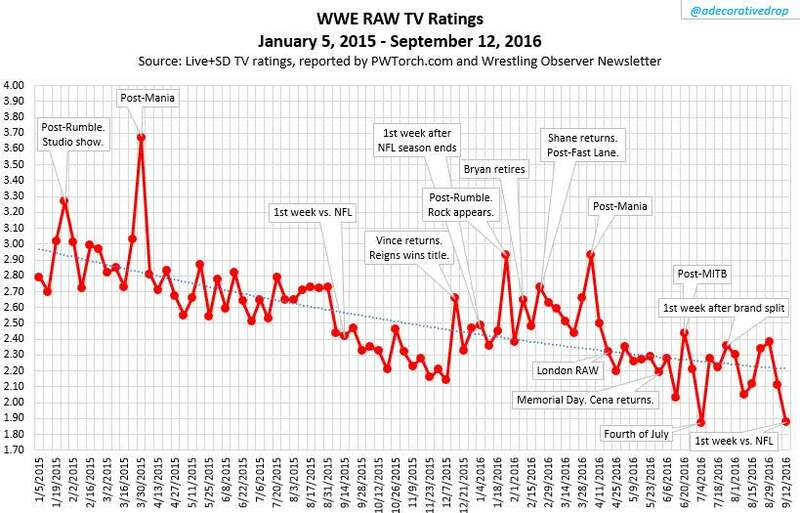 This decline in ratings doesn’t seem consistent with a decline in actual WWE popularity however. 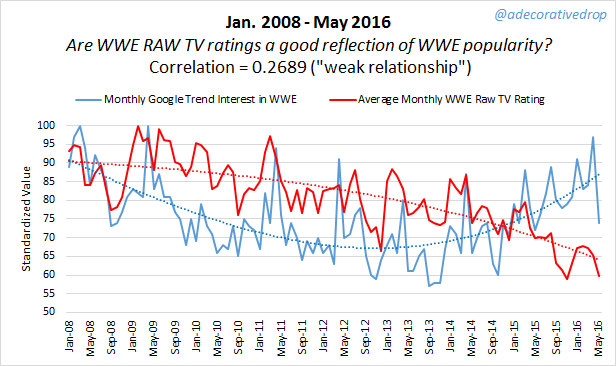 An analysis I did earlier this year showed the correlation between RAW TV ratings and Google interest in WWE started breaking down by 2013. If anything, an inverse relationship began to develop between Google interest and RAW ratings. Furthermore, we don’t see a similar decline in WWE’s live event attendance or merchandise revenue, which would support the notion of a decline in popularity. If ratings aren’t reflective of popularity, do they really matter? They do matter to TV partners like NBCUniversal who provided WWE with 35% of the wrestling company’s revenue in 2015. Television is WWE’s biggest source of money: bringing in more dollars than either he WWE Network or its live event business. And viewership does matter to advertisers who buy ad time during WWE programming. One of the main attractions for the USA Network in keeping RAW and SmackDown is that they help the station rank well among other networks. In that area, WWE programming is still effective. Even against two NFL games on Monday night, all three hours of RAW still ranked in the top seven programs on cable for the night, according to Showbuzzdaily. Even as ratings have declined, RAW and SmackDown have ranked highly on their respective nights, which certainly suggests a decline in viewership of programming throughout television. As long as RAW and SmackDown maintain high rankings among other programs, they’ll continue helping the USA Network -- or any network that might have them in the future -- rank highly. Whether USA or any other network will see enough value in WWE programming in 2019 to justify continuing to give the company another huge TV rights contract is too difficult to predict for now. Even against a pattern of declining viewership throughout television, WWE can always overcome that pattern if it can find a way to create compelling new stars who actually make a difference to business: something the company has had great difficulty with at least since the rise of John Cena.